Image from Etsy store CraftieRobot. At the beginning of the year I bought this bag for 12 year old to take to school. 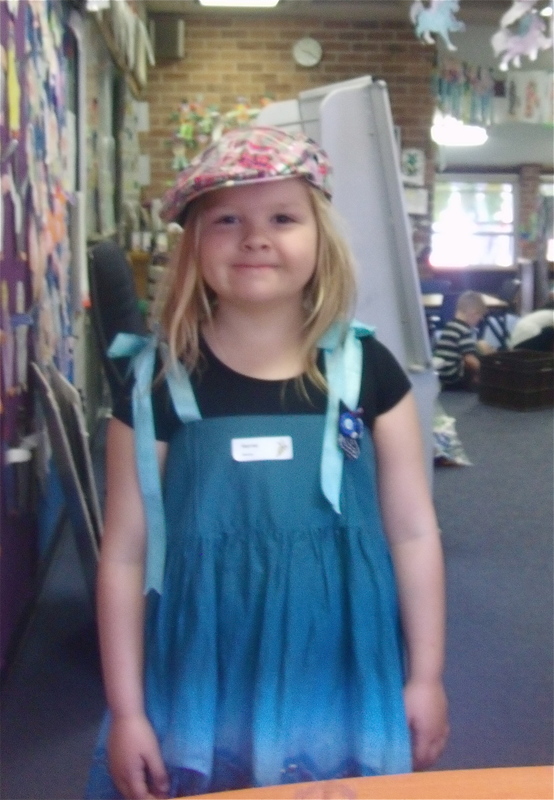 It was a little too small from the beginning and was pushed to it’s limits many times. ….. and ….well it broke. The closures came away and it got a ‘cannot be mended’ hole in the base. 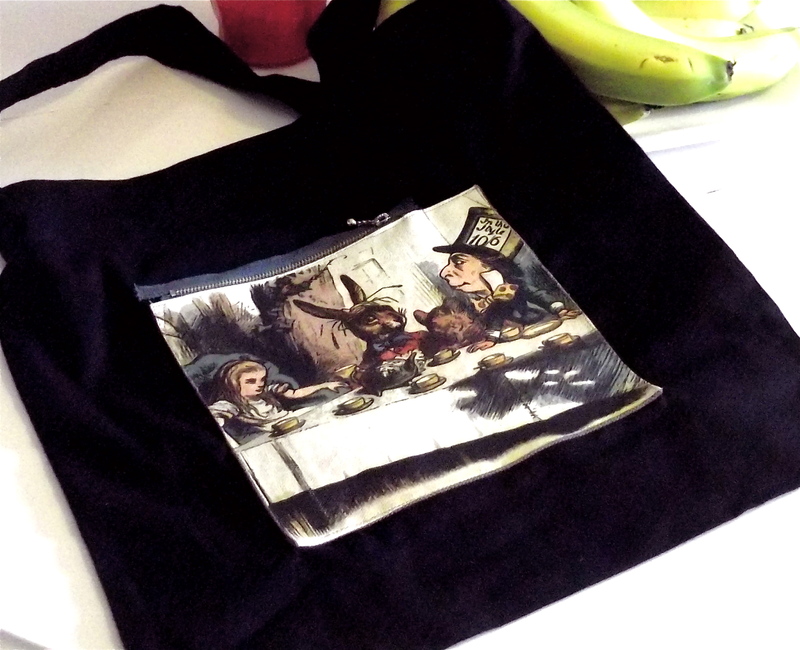 She was very sad because she really loved the illustration…… so I upcycled it into a new bag. 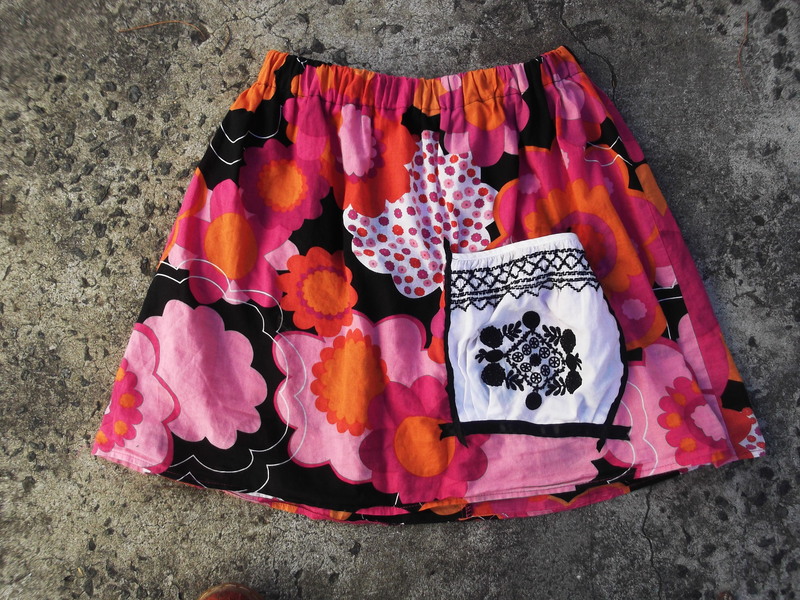 I used the picture as a zippered front pocket with a little pen pocket to the side. She needs a bag for her extras…. 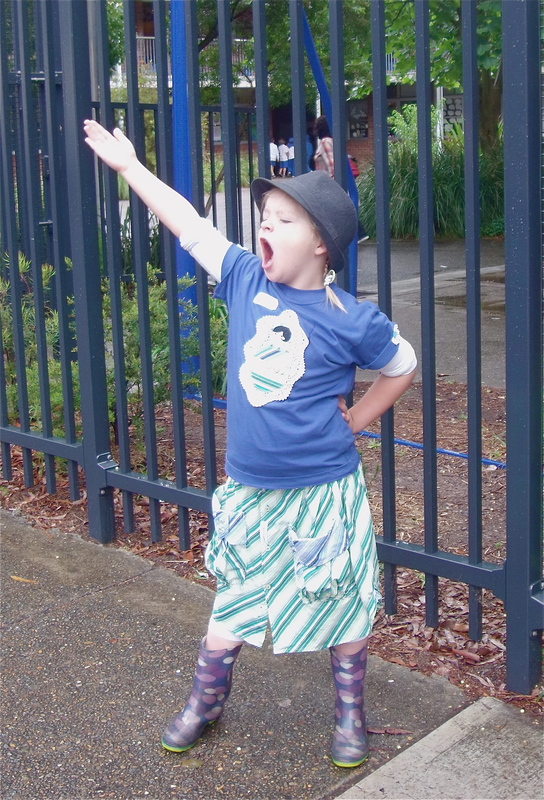 PE clothes, dance clothes, drama costumes….that sort of thing. I even reused the original bags inside pocket on the new one. The black bag was already made I bought it at BlankClothing for about $4. 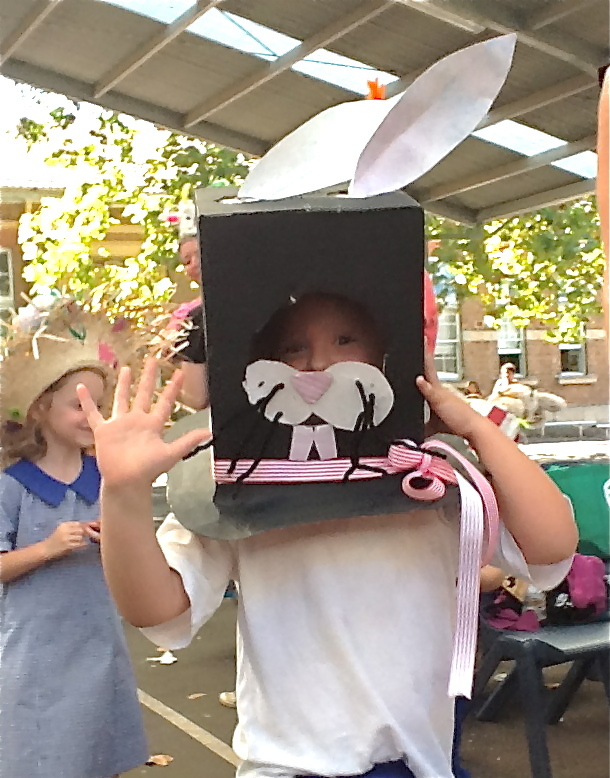 We pulled a rabbit out of the hat this year! 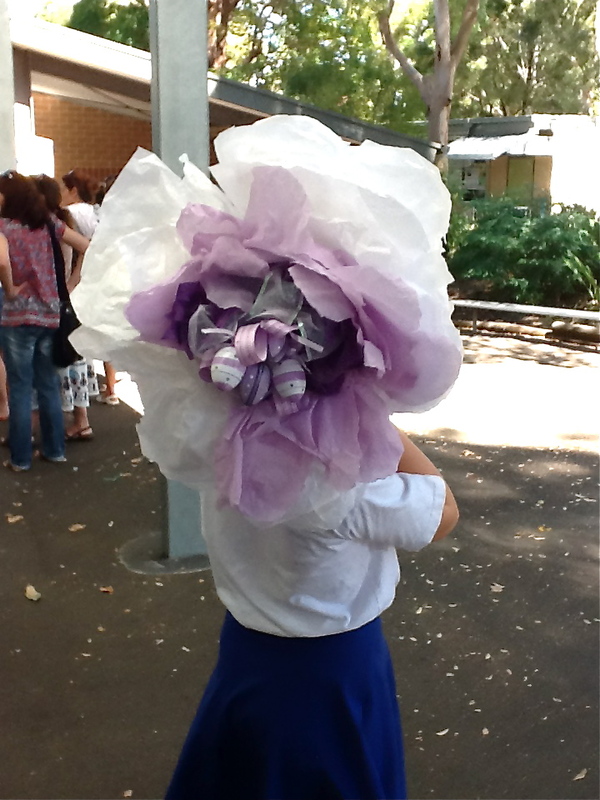 The deceptively simple easter egg flower hat/fascinator for 8 year old. You can see our inspiration here. Both hats cost less than $8. Mummy was really happy with the outcome, and the girls had a great time. 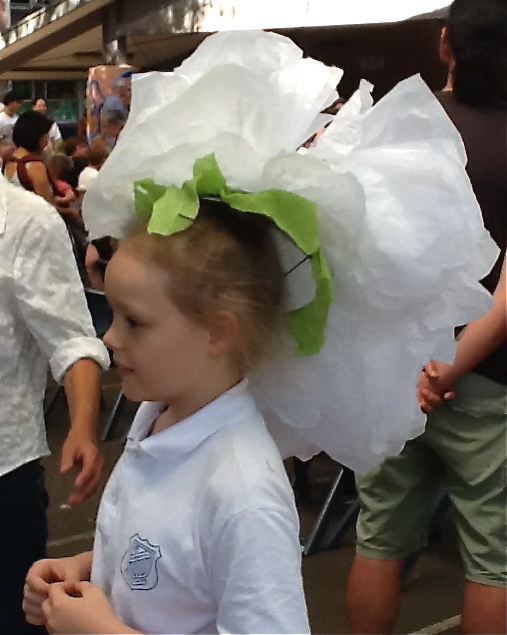 It’s something of a spectacle to see 730+ kids, plus a good number of teachers, getting creative. Magical rabbit in the hat. Designed by 5 year old. Made with lots of help from 13 year old. hd: So, Tony, why work for yourself? tc: Good question, it’s certainly not easy! hd: Great reasons. Good chance he’s a little entrepreneur in the making! So, in the last year, what exciting things have been happening at Well Spotted? tc: Since last year Well Spotted has re-introduced adult t-shirts into the mix. Not too many because I prefer to see my prints making kids funnier! hd: Do you have any new ‘funnys’ for us? tc: This year I have tried to encourage my positive side and come up with ‘Best. Day. 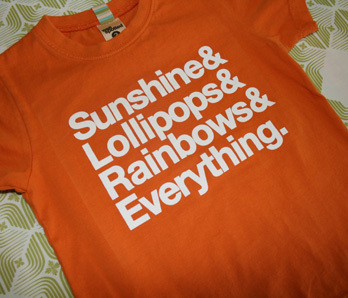 Ever!’ & ‘Happy Go Lucky’ & ‘Sunshine & Lollipops & Rainbows & Everything’. Just try being grumpy when you’re wearing one of those! Yes.... you could be the lucky winner of one of these Best. Day. Ever. t-shirts. See below for details. hd: If we want to stay in touch with what Well Spotted is up to through out the year, how is the best way to do that? happy go lucky. Available in Blue and Aqua. Shineshine...etc available in Pink, Orange and Yellow. hd: Last year, rather than offer a purchasing deal on your shirt…. which are really well priced anyway…..you offered a give-away. Thank for that. What would you like to surprise harrysdesk readers with this year? tc: Since I’ve been accentuating the positive this year I’ll give one lucky reader a ‘Best. Day. Ever!’ t-shirt. 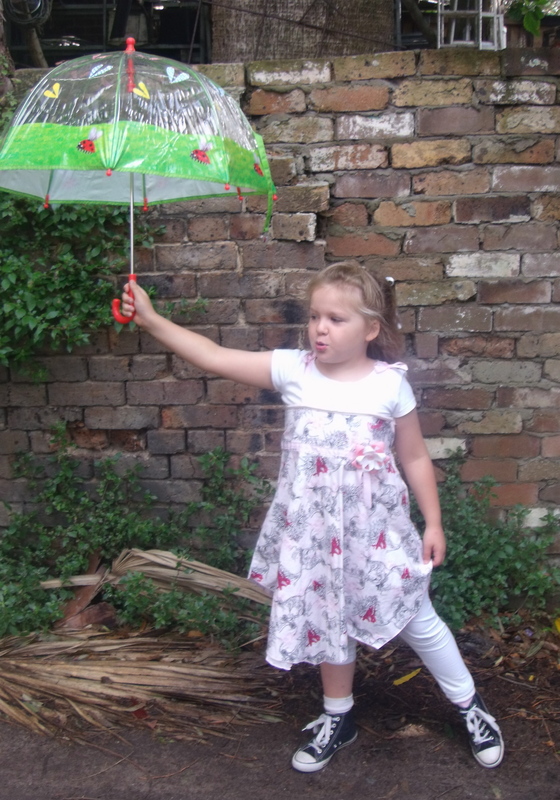 They come in coal or brown & are available from kids size 3-6m to 14y. Thanks Tony!! I feel very posititve about that already. Ok, so here is how it will work…. Leave a comment below telling us of one of your Best. Day(s). Ever. and you have the possibility of being spotted in the newest Well Spotted t-shirt. Prize drawn randomly ….lunchtime (sometime after 12 and before 3pm) on December the 6th 2011. 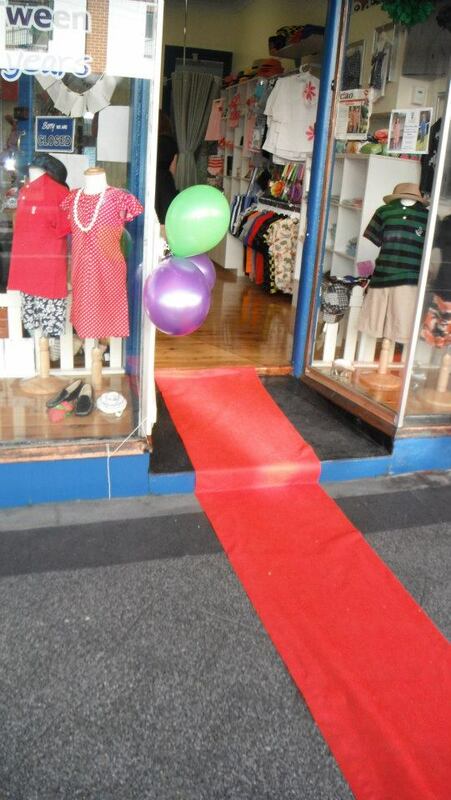 LBT Store Opening …and my little secret. 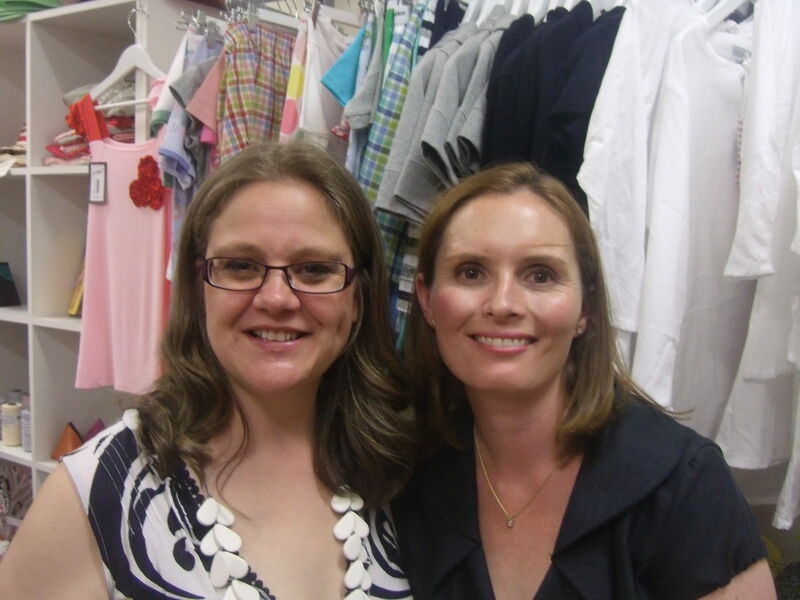 Myself and Bec at the opening. 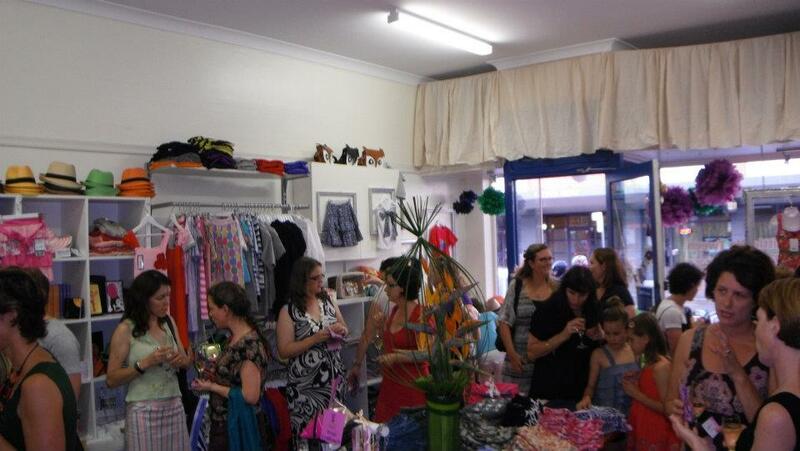 Last Thursday was the official opening of my friend Bec’s store in Newtown, Little Big Tween. Or LBT for short. You may recognise the name from a post I did a month or so back about a new wholesaler. Yes, harrysdesk accessories are available at LBT. 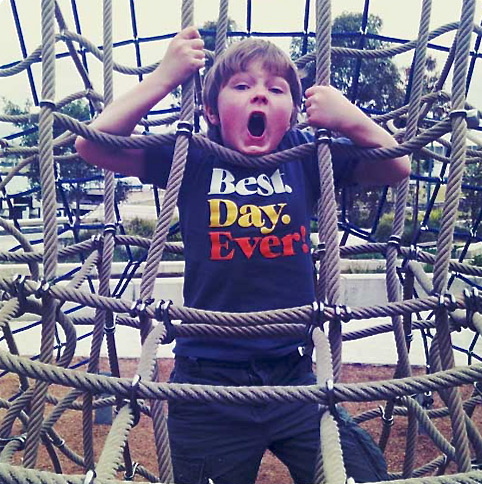 In the comments of the post I said I had more exciting news associated with this venture…. and now all can be revealed. LBT looking all gorgeous for the opening. A couple of months ago Bec asked me if I could help out with her clothing design drawings and fabric specs. Yes! what I trained to do all those years ago. ….and I have enjoyed it a lot. The sketching, dreaming and designing, to Bec’s specifications, has been nothing short of a pleasure. I will let you know once the winter collection arrives…. as that is the season I have been working on! At this point I am hoping I can continue to help Bec out as I can….learn lots from her ‘make it happen, with a smile on your face’ attitude…. and keep harrysdesk rolling along and growing into the new year. This may explain why the blog has been a little removed lately. Sorry…. and thanks for sticking around. 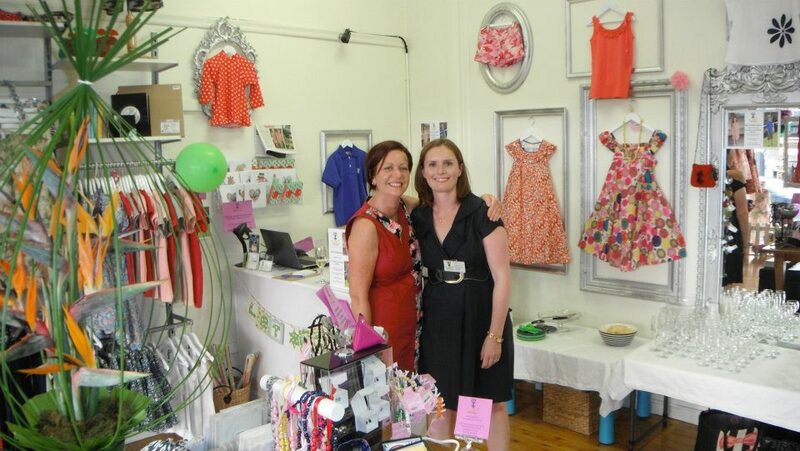 Therese (who works in the shop) and Bec before the crowd arrives. 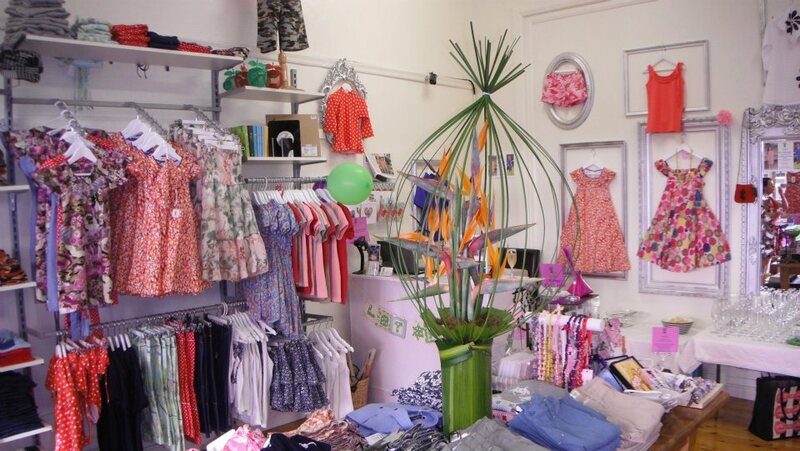 The clothing in the store now, is wonderful and seriously worth a look. If you cannot get to Newtown you can see it here. Or become a friend of LBT on facebook here. 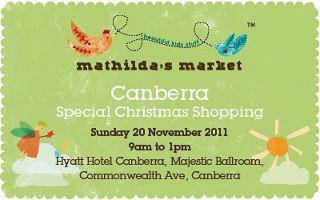 For any reader in Canberra ... you will find LBT at Matilda's Markets this Sunday.